Apologies that these pics were taken earlier in the year, but I thought I'd start with the backlog of older stuff I have lying around! Some of these shots appear elsewhere on Flickr and my own webpages, but I promise at least a few exclusive to this site, and there's no harm in letting them be seen by a few more interested folks. I should also stress that loads of the cinema and theatre ones were taken on legit tours as part of longer tours of such buildings in the area with a coachload of fellow cinema and theatre geeks, so if it looks like there are loads of folk milling around in some of them, that's because there is! But I'll only post places where there's a specific interest to this site - i.e. buildings with at least a partially closed-off, derelict area not normally open to the public at large. Anyways, enough waffle, on with it. 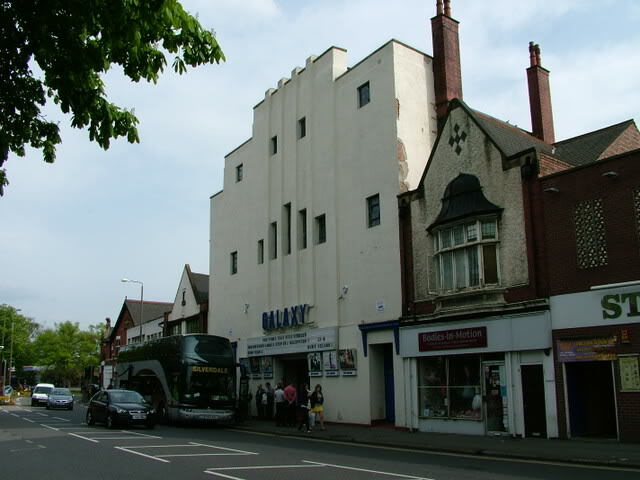 The Galaxy cinema in Long Eaton has gone by various names in its past. Anyone viewing the current plain white exterior and three small screens of this building would be forgiven for thinking it of little interest, but behind and above these is a building whose history and survival is quite extraordinary. Originally opened in 1910 as the St James's Theatre, it almost immediately became Vint's Picturedrome after being acquired by one Leon Vint. The inaugral film under this new name was "Flower of Death" on September 5th 1910. The owners and name changed frequently in those early years, and the building became the Coliseum in 1916, and the Scala in 1923. In December 1934, a fire led to a substantial rebuild by H. Hardwick Dawson, and the building reopened on July 1st the following year. In 1964, the building went over to bingo, and the upper part of the auditorium was hidden by a false ceiling. 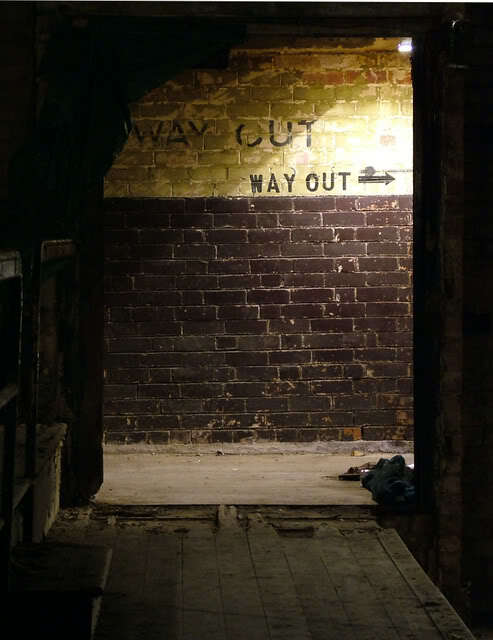 This closed in 1993, and shortly afterwards, another disastrous fire consumed the building. Remarkably, given the condition of the building by now (the fly tower and stage house was now roofless, and beetles had infested the charred remains of the auditorium! ), it was proposed to reopen it as a cinema. On January 5th 2007, the first small screen (70 seats) opened, with the second and third screen following a few weeks later (98 and 77 seats respectively). 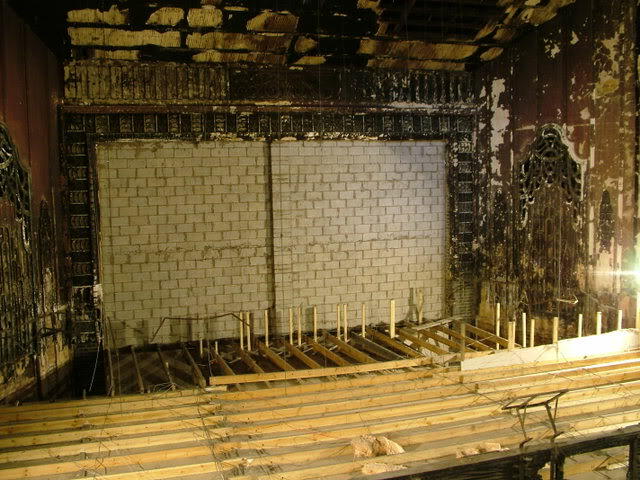 These screens all occupy the former stalls of the old theatre, side-by-side. 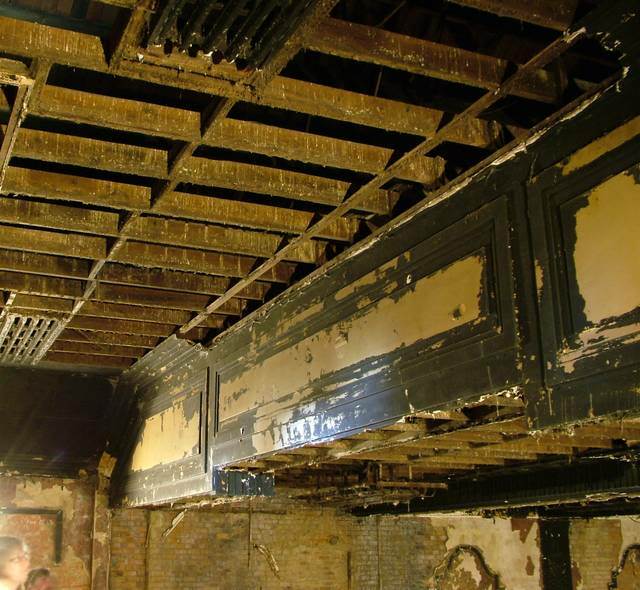 Upstairs, however, the ghostly, partly-charred remains of the old auditorium still survive, albeit with much of the plasterwork missing and the proscenium having been bricked-up. 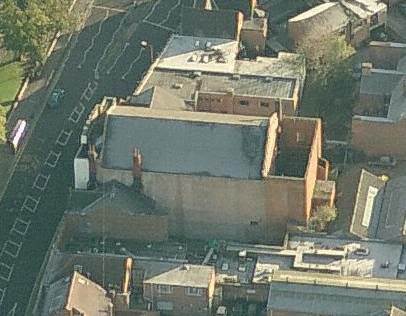 This aerial shot shows the layout of the building, with the roofless ruin of the stagehouse at the back. The exterior, which seems curiously tall considering the tiny wee ground floor screens it currently has - could there be something worth seeing upstairs?? Apologies for the angle, but the stupid coach chose that moment to break down! 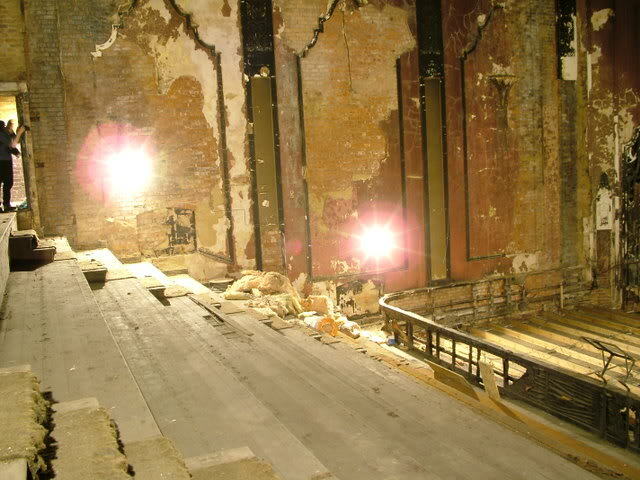 And here's the first view you get as you step into the balcony of the bricked-up proscenium arch. I have no idea if there's much to see beyond that in the former stage area, but having now been open to the elements for about 15 years, I'd imagine not much! Note the roof of the three mini cinemas downstairs. And looking from the other side of the balcony. 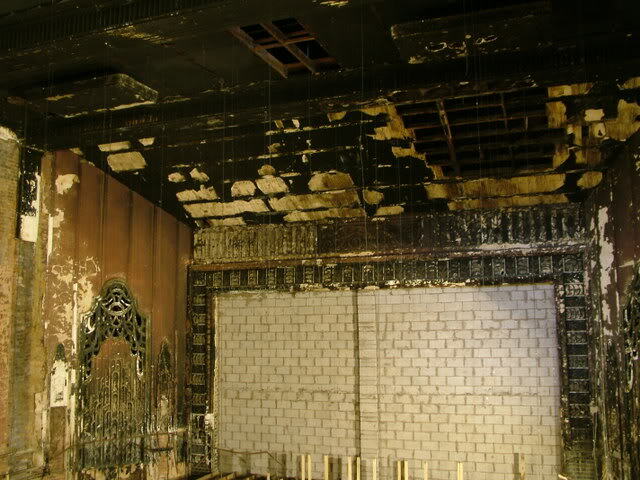 We were told that much of the missing plasterwork was not due to the fire damage (which was most visible on the balcony front) but by the subsequent beetle infestation which occurred afterwards, with the auditorium open to the elements. Getting rid of them entailed tearing off any infected areas. The seats, obviously, have long gone! 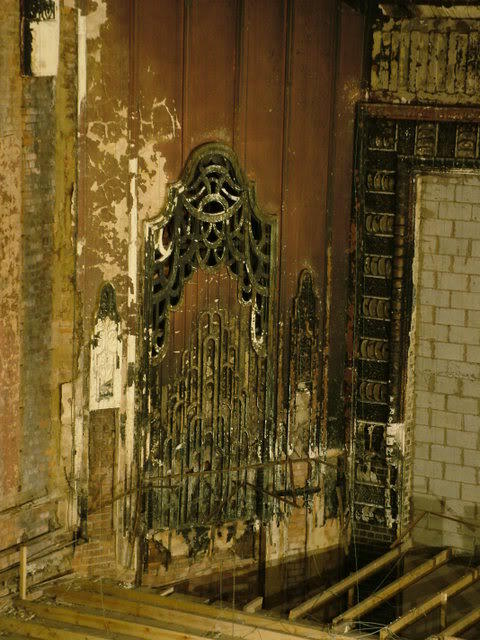 The grilles flanking the proscenium, which I presume date from the 1934 rebuild, as they seem typical of the era. View of the projection portholes at the back - I don't have pics of the box itself, but can't remember why - either access wasn't possible or there wasn't anything worth seeing in there! 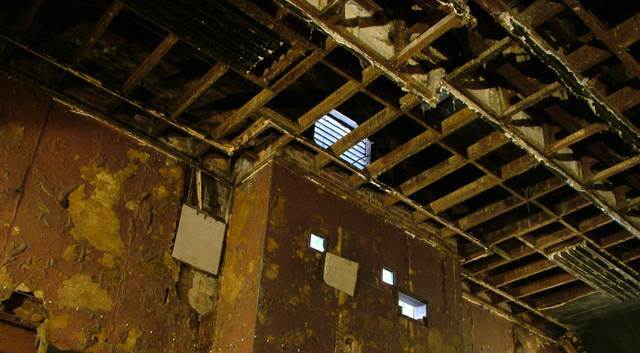 The destroyed ceiling just in front of the projection box - note the cutaway in the centre to give clearance for the projection beam - quite common in theatres which were converted to cinema use. The balcony side exit, looking rather less than luxurious!